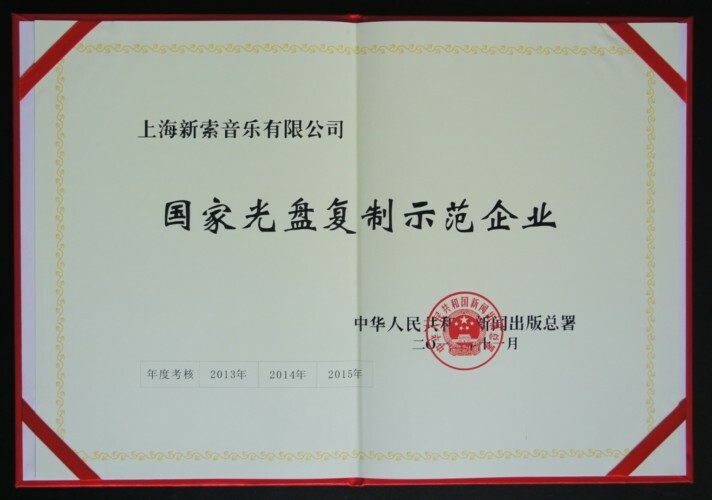 Shanghai Epic, Sony DADC’s Joint Venture in the People’s Republic of China (PRC), is pleased to announce that it has been awarded „National Model Replicator 2012” status by the PRC’s GAPP (=General Administration of Press and Publication). From more than 100 optical disc manufacturers in China, only 4 have been selected for this certification because of their outstanding business performance and their full compliance with all regulations and good practices. The GAPP certificate covers Shanghai Epic’s CD, DVD and Blu-ray Disc manufacturing services, the company’s recently founded content licensee model, as well as its webshop services. “Shanghai Epic’s objective is to become the business partner of choice for both the international and the Chinese entertainment industry. Now, certified as “National Model Replicator”, we have achieved another major milestone towards this goal. This certificate is a special honour for us and, more important than that, our clients will benefit through simplified approval procedures and more business flexibility in the Chinese market” says Xiao Wu, Managing Director of Shanghai Epic and Sony DADC in China. Sony DADC is a leading end-to-end services provider for the entertainment industry and beyond, offering world-class digital and physical supply chain solutions and optical media replication services. The company’s network consists of service offices, optical media production, distribution and digital facilities worldwide.